At Thomas A Becket pupils are proud to wear the school uniform, helping them feel a collective commitment to each other and the school. It helps pupils to maintain a learning mindset, and while we celebrate each child’s individuality wearing the school uniform enables them to share in the collective identity (values and ethos) of TAB. 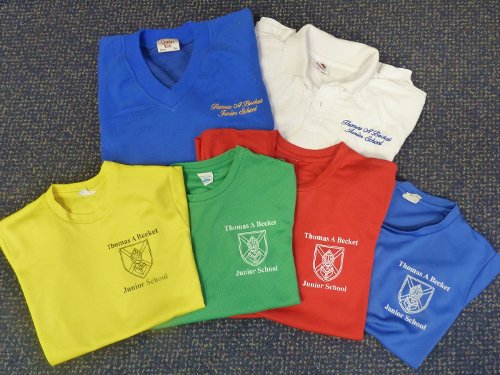 From September 2015 the school became Thomas A Becket Junior School. Our uniform remained the same apart from the small change to the name. The existing uniform may continue to be worn by current pupils until they leave the school. White polo shirt, royal blue V-necked sweatshirt, grey/black trousers (short or long), grey/black skirt, pinafore dress, sensible black flat shoes (not trainers). White shirt, royal blue tie, royal blue V-necked sweatshirt, grey/black trousers, grey/black skirt, pinafore dress, sensible black flat shoes (not trainers). Trousers: Grey or Black formal trousers or shorts in plain material. Neither the trousers nor the skirt should be of a 'fashionable' style e.g. denim & lycra material are not permitted, neither are extra buttons / zips / sequins / rips / logos. Belt (if required): Plain black only. Shirt: Plain white shirt (formal collared shirt in winter, collared t-shirt (preferably with school logo) in summer). Formal collared shirts (winter) should be worn with all buttons done up and all shirts should be tucked properly into trousers / skirts. Sweatshirt: Royal blue ‘Thomas A Becket Junior School’ sweatshirt. Tie: ‘Thomas A Becket Junior School’ tie (winter uniform). Ties should be worn with the knot covering the collar button of shirts. Tights: Black, navy, dark grey or neutral shades. Socks: Plain black, navy, dark grey only (white socks may be worn with dresses / skirts). Footwear: Formal black, flat “sensible” shoes only. Backless shoes, boots, plimsolls, or trainers are not acceptable. Coats: Coats / other jumpers / scarves are not permitted to be worn during the school day (except on the playground at break & lunchtimes). Hair: Extreme styles of hair are unacceptable. These include: unnatural colours, close shaved heads, shaved lines and shaved patterns in the hair. Parents will be informed immediately if the style of hair or colour is seen as inappropriate. If you are unsure of what is acceptable please contact the school in advance of getting hair cut. Long hair must be tied back during the school day. This is particularly important during practical lessons, such as Science, Design Technology, Games/PE. Jewellery: For safety reasons, only one pair of small (<3mm) plain metal (silver or gold) stud earrings may be worn. No other jewellery is allowed. If worn this will be confiscated by staff and returned at the end of the day. Nose studs and all other forms of body piercing are forbidden in the school. Watches may be worn. Mobile phones: These can be brought into school but under no circumstances should they be switched on or be visible during the school day, or used at any time while on the school premises. If pupils are seen using mobile phones on the school premises parents will be contacted immediately. Parents are also reminded that mobile phones are not covered under the school’s insurance policy. Makeup: Makeup should not be worn. The wearing of nail polish is not permitted. All pupils are expected to be in full uniform each day. Pupils will be removed from lessons if they are not wearing the correct uniform or their hairstyle is deemed inappropriate, and parent contacted. Parents should check with the school before purchasing items if they are unsure of whether they are suitable. The Headteacher’s decision is final. Correct school PE kit should be worn for all PE/Games lessons. Please note that West Sussex County Council regulations do not allow the wearing of any kind of jewellery (earrings; studs; watches; neck chains; bangles; etc) during any PE/Games lesson or other organised physical activities. Jewellery may only be worn on medical grounds e.g. when a child has recently had an ear pierced. If this is the case, please inform us in writing. Plaster tape may then be used to cover the ear. If you intend to have your child’s ears pierced please do so at the start of the summer holiday, and ensure that s/he can remove and insert his/her own earrings by the time the new term starts in September. Hair must be tied back during all Games/PE lessons. PLEASE REMEMBER TO NAME ALL ITEMS OF CLOTHING CLEARLY!